Thanatos seems like a perfectly trustworthy dude, I’m sure it’s perfectly reasonable to trust him to inject you with stuff. Ignore the fact that he’s finger-arching up there. Everyones gonna love 1st panel! Cool stuff Grundy! Oh geez, I have a feeling the next few panels are about to get REALLY grim. Excellent. I’m not gonna lie. 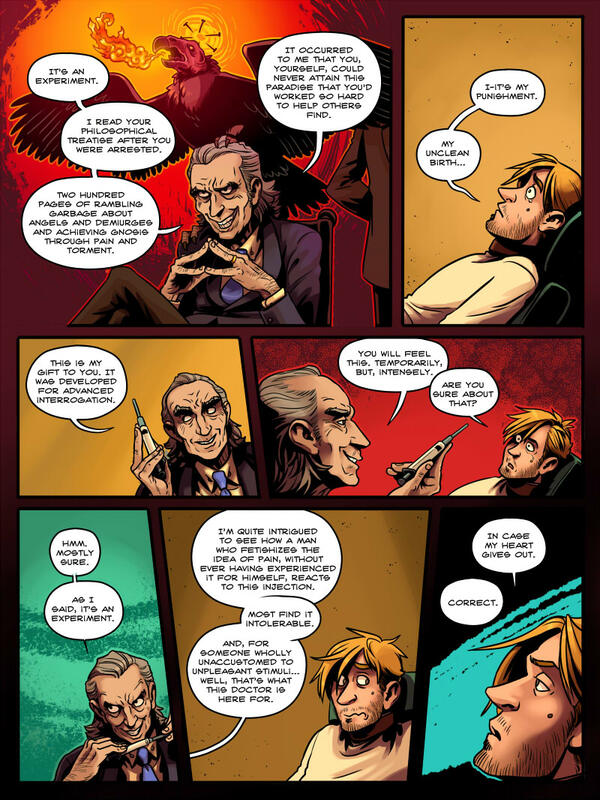 I now think Thanatos is pretty much the best character in this comic, and I would love to work in his R&D department. OOoh he's an occultist. Neat-o!. Sorta. He’s definitely some flavor of gnostic. Why/how did my name change from “guest” to “skin”? Sounds as if he mixed Gnosticism with Antinomianism. Interesting change of expression in the last panel. Yes, yes, everybody love that first panel. XD I sure do! Thanks for makin’ this comic, Grundz! Had to look up what that meant. So he thinks he’s damned because his parents weren’t married. Quite fucked-up mentality that’s made many a parent abuse and murder their child. Fire-breathing condor with a halo of nails is easily the goddamned coolest think I’ve seen all week. Worth the wait. Love this page, love this concept, love this character. I wonder if the hallucination in panel 1 is from the treatise at all. This is pretty cool, honestly hoping he gets something positive out of this ‘gift’.